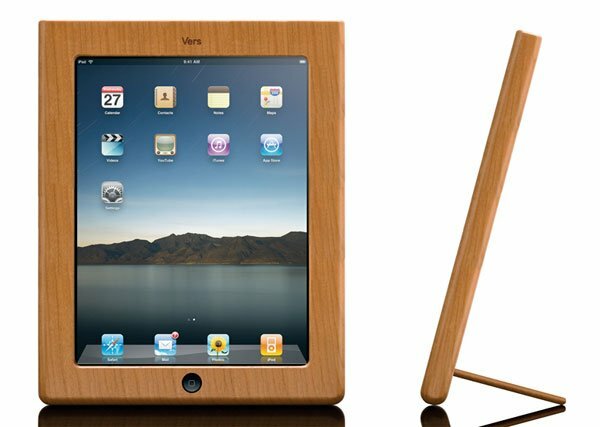 The Apple [AAPL] iPad hasn’t even gone one sale yet, delayed until April, and we have already seen a large amount of accessories for Apple’s new tablet device, the latest one is the Vers Handmade Wooden iPad Case. We have seen a number of these Vers wooden cases before for the iPhone, and now you will be able to buy a wooden case for your shiny new iPad. The Vers Handmade Wooden iPad Case comes with a built in kickstand, and the case is made from hardwood and bamboo, and the kickstand has been reinforced with steel to make sure it lasts. The case give you full access to the 30 pin connector so you can charge your iPad without having to remove it, and it also gives you full access to the volume controls. The Vers Handmade Wooden iPad Case will be available shortly for $80 from Vers. Dont forget to check out our Apple iPad Review.